Together with DNA Genetics, Reserva Privada Purple Wreck Feminized Marijuana Seeds are the result of crossing their Urkel mother plant with a T4 Trainwreck male. Urkel is one of California’s most sought after Marijuana strains, demanding the highest price when available for sale. The resulting cross of the Urkel mother with a Train Wreck male resulted in short, squat Marijuana plant, contain 60/40 Indica to Sativa genetics. A strong, vibrant form of Purple Kush, although not a true Purple strain it does contain many Purple Kush attributes, including the anticipated purple coloring which defines the Purple Marijuana strains so well. Reserva Privada Purple Wreck Feminized Marijuana Seeds flower and mature at approximately eight weeks from the onset of flowering, Marijuana growers can expect their plants to grow large buds with the defined purple coloring which increases as the plant matures. The introduction of Train Wreck with Urkel has resulted in Purple Wreck feminized seeds that grow quicker and more vigorously than the original Urkel, but still maintains the distinctive sweet, fruity aroma and flavor. Its Train Wreck father kindly donated its large exploding buds, which now incorporate the purple hue and coloring from its Urkel mother. Yields are high considering Purple Wreck Marijuana Seeds produce short plants, with an average harvest of approximately 500 grams of potent, dense Marijuana buds returned per square meter given optimum growing conditions. Buy Purple Wreck Feminized Seeds. Reserva Privada Purple Wreck feminized Marijuana seeds are available as single seeds, or as part of a pick ‘n’ mix variety. 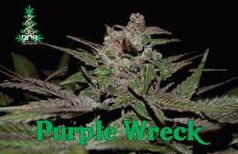 Complete packets can also be purchased containing 6 Purple Wreck seeds per packet. With guaranteed shipping of your chosen Marijuana Seeds to the USA, and the lowest prices available online, order your Purple Wreck feminized Marijuana Seeds today. You can learn more about our recommended Purple Kush strains and Marijuana Seeds below.